“Brothers! Sisters! Hear my words on this most illustrious of days. For too long have the proud people of the Stormlands lived under the rule of weak and feckless leaders. For too long have we been hobbled by those unwilling to do what was needed. I loved my father deeply, and I know that he loved this land, but he was no king. He was not born to lead men. The Stormlands were once home to great heroes, the birthplace of Kings and Queens, warlords and conquerors, master craftsmen and sages of unsurpassed renown. But that was then, and this is now. Centuries of decline have left what was once glorious in ruins. The vaunted halls of the Stormlands lay crumbling and forgotten. There was a time when the spears of the Stormlands struck fear into the hearts of our enemies. There was a time when our cities were the envy of nations across this world. What was once the heartland of an unsurpassed empire has been relegated to a backwater by those who tremble at what we once were. Upon the ascension to his title. My name is Morbis, and I am a fully paid off, pledged Duke. I’m a lifelong gamer starting from when my Dad first introduced me with his Sega Master System. Over those years, I have been involved in the leadership of multiple large guilds, frequently taking the position of the right hand man to the ultimate group leader. I have essentially been playing the role of a Duke for the majority of my adult gaming career. I am also the host of The Town Crier, a weekly CoE focused Podcast. I am perhaps one of the most publicly visible members of the community after the Monarchs and BicycleWalrus. My opinion on many of the important positions that a Duke might hold within ‘Chronicles of Elyria’ are a matter of public record. You will know exactly what you are getting if you decide to join The Stormlands. The Stormlands are a once powerful nation, long forgotten by its allies, now reawakening to their ancient heritage. Ravaged by near constant storms summoned by an ancient and unknowable artifact, the Stormlands have suffered through centuries of weak rulers, all of whom have forsaken their heroic blood. But now a new generation has come to power, a generation promising a return to the old ways of glory. The Stormlands are the perfect Duchy for those who want to strive towards greatness, understanding that the clearest path is through hard work and dedication. Those looking to live in an environment that promotes friendly competition, that promotes the belief that self improvement ultimately leads to the improvement of the group, will find like minded compatriots within the Stormlands. Though we intend to strike our own path culturally, we will be drawing inspiration from a number of sources. The ancient Greek concept of Arete is core to the social contract of the Stormlands. The classical building style of the ancient Romans, combined with particular social norms of the ancient Scots will also feature heavily within our lands. It is important to note that I intend the Stormlands to be culturally cosmopolitan. The norms found in one county might not mirror those found in another. The themes brought in by new Counts will be critical to making the Stormlands a varied and interesting Duchy. Who are the Stormlands looking for? As a newly announced Duchy, The Stormlands are primarily looking to comprehensively fill out our Count and Mayor/Baron rosters. A strong foundation of pledged Counts is critical to our ability to enter the game in a strong and stable manner. We currently believe that to be successful, we will need at least fifteen active Counts, and each of those counties will need to have their own strong roster of Mayors and Barons. Most importantly we are looking for relaxed, laid-back Counts who are willing to put in the work necessary to build up their own communities. I am a firm believer that good temperament and willingness to improve trump all other qualities in a leader. A lack of leadership experience will not necessarily be seen as a black mark against potential Counts as long as they exhibit those other two traits. We will also need people to fill out those counties. The Stormlands encourages each and every one of our affiliated Counts to aggressively recruit to do just that. We will provide whatever support deemed necessary to give our Counts a leg up in this regard, all they have to do is ask. There is a place for almost every playstyle within the Stormlands, and we will endeavour to provide a safe and stable environment for our citizens to grow and build within the game. Whether you want to defend the realm against roving bands of bandits, build a merchant-led monopoly that spans the continent, or simply own a small farm in the mountains, the Stormlands welcomes you with open arms. What makes the Stormlands special? First and foremost, the Stormlands will stand for the principle that the improvement of the individual is the improvement of the group. As I hinted at earlier, I am a firm believer in the ability of the common person to accomplish great things when properly supported, and one of the core tenets of the Stormlands is ensuring we are there to provide that support. Too often, people discount themselves as lacking the necessary talent or skill in a field, immediately excluding themselves from really achieving self improvement. The notion of unsurmountable inborn talent will be anathema within the Stormlands. We will constantly push our citizens to be the very best Elyrians they can be, encouraging them to step outside their comfort zones and participate in areas of the game they might otherwise ignore. It is my belief that every willing citizen should be fully capable of supporting themselves both economically and in terms of personal security, and that is an ideal that will be central to daily life within the Stormlands. An invader to our lands will find a spear waiting behind every blade of grass, often wielded by the individual who forged it. By fostering such an environment of simultaneous exceptionalism and dilettantism, it is my hope that the Stormlands will grow into a powerhouse that rivals even those Duchies of the Kings and Queens of Elyria. What will really make the Stormlands unique within Elyria will be accomplished through the use of my design experience. Rather than choosing to have a personal set of armour built by the developers, as per the Duke tier pledge, I will instead be choosing to drop my design experience down to have a relic designed. This relic will, hopefully, mirror the capabilities of the Bowl of Winds from the book series the Wheel of Time. At the beginning of the game, this relic will effectively be stuck on one mode, causing near constant storms to gust throughout the Duchy. These storms will have raged for so long that the people of Elyria will have forgotten the original name of the land, instead naming it for its most prominent feature. The outline for this Relic has been discussed with the developers, and they seemed receptive to the idea. The exact nature still has to be worked out, but I am confident that the core concept will make it through their requirements. The Stormlands are an official Duchy of the Kingdom of Vornair, guaranteed a position within their lands upon land selection. We follow the political will of King Evelake Rhyne of Vornair, and trust in his ability to lead us down a path of strength. Mountains. The presence of mineral-rich mountains is core to my vision of the Stormlands. I intend for my personal County to specialise in the large scale production of metal goods, specifically weapons and armour, and if possible, I would like to extend such a speciality to the Duchy proper. Doing so will require ready access to base materials, which are most likely to be found within mountains. However, even without this choice of speciality, I find the aesthetic of mist-clad mountains particularly resonant. 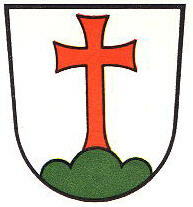 Temperate. The features of my native Scotland are particularly appealing to me, again for primarily aesthetic reasons, and as such I would like the Stormlands to closely resemble those features. By settling within a temperate climate, we will also guarantee a level of fecundity that will allow the Stormlands to feed itself. Densely Forested. Once again, primarily for aesthetic reasons. Sprawling forests that fuel the flames of industry while simultaneously sparking tales of fell beasts and long lost ruins makes the storyteller in me all aflutter. Rivers. Access to fresh water, easy trade with those both up and down stream, and the interesting fauna of the Elyrian river systems all call to me. It would be rather difficult to raise packs (holts?) of Otterbears without ready access to their natural habitats. I’d rather not run Elyria Seaworld. Ocean Access. While it would be nice, and a playstyle that I would support, nautical themed adventures have never really struck a chord with me. Trade advantages, plus the military possibilities such access would provide, are highly valued, but not such that it places this feature higher on the list. Obviously, if you have read this far, you can tell that I like to write stories and build worlds. I have an extremely deep history within the tabletop RP community, involving myself in both their play and their actual development, though always as an amateur. This passion easily transfers over into the digital realm. Although I do not tend to involve myself in what I call “tavern RP”, I have no issue with those that do. Instead, I prefer a more action-orientated form of roleplay, where the stories that naturally develop through the world are picked up on and magnified as much as possible. I would much rather participate in an epic quest to craft the ultimate weapon, than sit about in an inn and talk about how it happened. This is the style that I will be pushing within the Stormlands. If you want to build an epic story, go out and perform epic deeds. If you want to be known as the greatest bard in the land, go out and perform original material in the inns and courts of the nobility. Do, rather than Be. Joining the Stormlands this early on is relatively simple for most people. Those looking to join as citizens, barons and mayors need only visit our community Discord and make their intentions known. On the other side of things, those Counts that look to join the Stormlands will undergo a friendly interview before being allowed to pledge their loyalty. This is to make sure that the expectations of those Counts aligns with what will be required of them, as well as to make sure we do not allow toxic individuals to poison whatever community we have built. This interview will also be conducted on Discord. You can join our Discord by clicking the picture below. The Stormlands will follow a relatively standard form of feudalism, with the in-game positions of power roughly translating to position of government. Those higher on the feudal hierarchy can expect to wield more political clout on the long-term goals of the Duchy, while those lower will be able to make their will known through representatives. I am absolute in my determination that the common people of the Stormlands have some avenue for political expression, and the current intent is to allow that through a series of bureaucratic councils. It has been my experience in running gaming communities that most attempts at a true bureaucracy in online games tend to fail, and so these councils will initially be kept both loose and advisory until our ability to support firmer rule has coalesced. The lowest form of these councils will be the People’s Council. Each county will be given the opportunity to run a democratic election from which a representative will be nominated to sit on the People’s Council. These representatives will meet at set dates with the Duke, allowing any issues from the common people to be expressed directly. Re-elections will be hosted on a semi-regular basis, and oversight of these elections will be provided by the Duke and their staff. Above this will be the First Council. Each Count will be given a seat on this council for as long as they hold their hereditary title. The First Council will likewise meet with the Duke to discuss Duchy wide matters and to commit to large scale projects. This seat will be held by the title, rather than the individual, and so any changes to the holder of that title would immediately result in changes to the council. Alongside this will be the Second Council. This council will be made up of ‘High Barons’ who will act as the Duchy’s generals and chief judiciaries. These High Barons will be selected by the Duke from the pool of Barons within the Duchy. This council will generally only meet during times of particular unease within the Duchy, such as during times of war. And lastly there will be the Close Council. 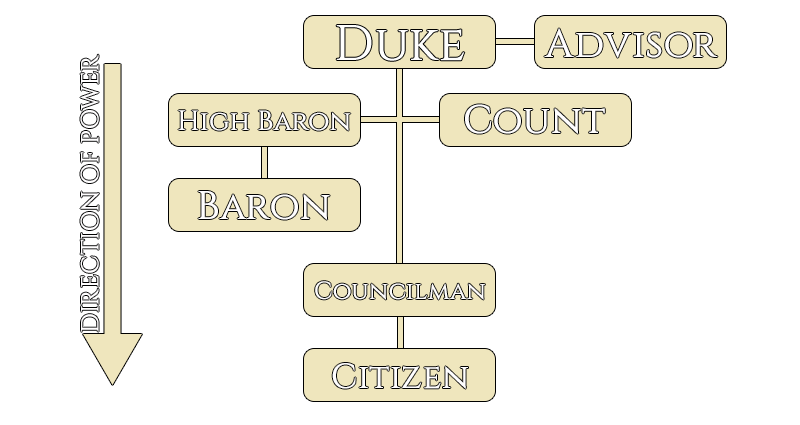 This council will be made up of individuals directly chosen by the Duke. This council will act with the authority of the Duke in most matters, effectively acting as a ‘Hand of the King’. Otherwise, the day-to-day managing of the lands will be left to those who are, per the feudal system responsible for them. The work involved in the running of a Duchy is far too much for one person alone, or even a council of people. The delineation of these responsibilities is a necessity for the smooth running of the lands, even if it might occasionally slow down the decision making process. Each Count will be given ultimate responsibility for the commercial and social growth of their County. They will be required to recruit and administer those who join their lands, as well as act as an intermediary towards the Duke for their people. Overarching goals for the realm will be passed down from the Duke, and it will be expected that the Count and his staff will act in the best interest of those goals. Each Baron will be empowered by the Duke to police the territory assigned to them. They will be supported monetarily to recruit and train a standing militia capable of responding to local threats, as well as recruiting and supporting contingents of full-time soldiers who will assist in the policing and training of the local population. During times of war, the Barons will be responsible for marshalling the militias within their territory and leading them in any engagements. High Baron will be a title specifically created for the Stormlands, and does not currently have a mechanical or pledge level analogue. High Barons will be individuals selected from the ranks of the standing military, and each will be assigned a region of Barons to manage. They will act as an intermediary between those Barons the the Counts within their region, as well as acting as a source of authority for minor concerns. By removing Barons from the standard feudal chain in this manner, it is my hope that they will be made exempt from the daily politics of County life. This will assist in allowing those Barons to focus more of their time on their own, more security oriented tasks. Mayors will act under the supervision of their local Count to build up the commercial and social growth of their villages, towns and cities. The exact method of this supervision will largely be under the control of the local Count, with general oversight provided by the Duke to prevent abuse. The Common Folk will act in the best interest of the Duchy in all that they do. They will pledge allegiance to their local Count, and commit themselves to a path of self improvement. In doing this, they will also commit themselves to improving the Duchy proper. The Stormlands will field the most skilled heavy infantry on the server. This is my ultimate goal for the military. The spearmen of the Stormlands will be the match of any soldier of any foreign military. Through constant competition, training, and innovation we will make the server tremble when the Stormlands march to war. We will disseminate the lessons learnt by our professional army down to the everyday citizenry so that they too may defend themselves. By empowering the common folk of the Duchy, we will protect our lands side by side, with little to differentiate those who dedicate their lives to the defence of the realm and those with more social or commercial desires. Stormlander weapons and armour will be found throughout whichever Kingdom we call home. They will be sought out by the quartermaster of armies across the world. King and Queens will demand Stormlander steel for their honour guards. We will grow wealthy selling our arms to allies during times of peace, and dominant in war wielding them against our enemies. It is expected that each of our Counts will have their own particular areas of expertise, and we will make every attempt at leveraging those specialties to the benefit of the Duchy. As mentioned earlier, a degree of flexibility and willingness to step outside of one's comfort zones will be heavily promoted within the Stormlands, and that is expected to influence our commercially focused citizens as much as our militaristic ones. I would particularly enjoy attracting a County interested in the breeding and taming of animals to the Duchy. The possibility of Stormlander mounts being traded across the continent alongside Stormlander steel is something I would love to aim for. The official religion of the Stormlands will be a form of animist spiritualism, similar to the Faedin religion that has been described by the developers. Followers of this religion believe that all living things have a spirit or soul within it, and the honouring of these spirits is core to the daily lives of many Stormlanders. Stormlanders as a people are welcoming to divergent ideas, and so many find the beliefs of foreigners interesting and worthy of investigation. The followers of those foreign religions have found fertile ground to sow their own theological seeds, with many churches and cults sprouting up throughout the Duchy. Competition and the constant self improvement of one's abilities is central to life in the Stormlands, and this will be made evident through a series of friendly competitions that will run throughout the land. At the highest level this will involve setting each of the Duchy's Counties against each other in regular tournaments, covering a wide range of skills and professions. Each Count will be given the opportunity to nominate participants in these tournaments, with the winning County being granted boons, as well as prestigious titles, until the next round of events. The boons granted through these tournaments will always be relatively minor in power. The intent is not to allow those who succeed to rise up even further, but to encourage everyone within the Duchy to actively improve themselves and strive for greatness. The Counts and Mayors of the Stormlands will be encouraged to run similar competitions within their own lands. By creating ladders of advancement for individuals, from a local town’s tournament up to the grand tournaments hosted by the Duchy, we will provide the motivation to begin on the path to greatness. The official colours of the Stormlands will be the deep blue and shining silver of a storm ravaged sky. The official emblem of the Stormlands will be a silver stormcloud throwing down three bolts of golden lightning, two smaller, minor bolts and one larger, central primary bolt. People from the Stormlands are Stormlanders, and they do Stormlander things. I would like to come forward as the first person to pledge allegience to my new Duchess Morbis! Now see, you joke about that, but I'm going to need a right hand person, and right now you are top of the list. We might be taking our heterosexual life partnership to the next level is what I'm saying. Well certainly want to visit the Stormlands to see the storms and maybe the relic! I do not suggest Kite flying in this Place. Count Talon Ashwood, Protector of the Ash Forest, Lord of Lyconia, Mayor of Ashford. The Stormlands has welcomed its first official member in the form of Night! I'm not sure what your CoE forum name is, but welcome to the land! Night will be a useful ally for some of our activities. Namely carousing, which is best done in the shade of the world. I'm a Baron who's interested in doing some Trison breeding and the Stormlands sound like the place to do it. Hello, I'm currently a layaway countess looking for a duchy and kingdom to occupy before looking for any barons/mayors to occupy my county. My primary desire is to be near water and build ships/boats for trading or other purposes, but should that not be possible, I wouldn't mind breeding mounts of all types and/or resource farming(food, metal, herbs) and set up trade caravans(with protection) to import/export goods around the duchy(and maybe kingdom/kingdom allies). I'm also open to other suggestions. I can't say I have much, if any, leadership experience, so being a countess makes me a bit nervous... However, because of that, I want to travel(and explore) around my county at least once a week to check on the towns and cities(and even the hamlets) to give what aid I can if help is needed. Vornair is for the Nords! The Stormlands would like to officially welcome Lady Isla Reinleif (Outrageous) of Belcourt, our first Countess. The Stormlands are always looking for more people. Though we are focusing our efforts on building our nobility, anyone who wants to live in a Duchy focused on self improvement and excellency has a place within the Stormlands.